Having been launched in the UK and Ireland earlier this year, along with the 2014 Alfa Romeo MiTo and Giulietta, the motoring media had the opportunity to push the Alfa Romeo 4C to its limits on track at Mondello Park during the press launch, and then later to experience it on public roads over several days, to get a true understanding of the breadth of the car’s abilities. Members of both the APMP and the Sunday Times Ireland / CompleteCar.ie judging panels were particularly appreciative of the advanced, lightweight materials employed in the construction of the Alfa Romeo 4C, which results not only in astonishing performance and exceptional handling characteristics but also in lower fuel consumption and reduced CO2 emissions, which in turn has a positive knock-on effect in terms of purchase and motor tax. Indeed, the relatively low level of registration tax levied on the Alfa Romeo 4C is part of the reason it represents such astounding value at €69,900 (£45,000 OTR in the UK) having been described in the Sunday Times Ireland as “an out-and-out bargain”. The members of the APMP Car and Van of the Year Awards judging panel are amongst the most respected motoring writers in Ireland, representing 45 well-known publications across all media, including national and regional print media, TV, radio, blogs and websites. Vehicles are judged on a wide variety of criteria including design, performance, efficiency, safety, technology, value-for-money and driver appeal based on the test drive experiences of each jury member. The Sunday Times Ireland judging panel is comprised of Sunday Selection editor Richard Oakley, as well as the editor and senior correspondents of the leading Irish motoring website CompleteCar.ie: Shane O Donoghue (editor), Dave Humphreys and Paul Healy. The awards take all cars on sale in Ireland into account, not just the cars on sale in the past 12 months, and are judged across all pertinent criteria including practicality, running costs and, of course, driving pleasure. The Sunday Times/ CompleteCar.ie judges proclaimed the Alfa Romeo 4C to be “easily one of the most exciting cars you can buy right now,” noting that it is “a complete blast to drive”. Designed and engineered by Alfa Romeo and built at the Maserati plant in Modena, the mid-engined Alfa Romeo 4C employs the latest technologies of Alfa Romeo’s newest models: The new, all-aluminium 1750 Turbo Petrol engine; the latest-generation “Alfa TCT” dry twin clutch transmission and theAlfa DNA drivingmode selector – now with a new “Race” mode. Less than 4m in length and with a wheelbase of 2.38m, the Alfa Romeo 4C’s compact shape accentuates its remarkable agility: With a dry weight of 895kg and a 40:60 front-to-rear weight distribution, the 4C is capable of generating 1.1g of lateral acceleration and in excess of 1.2g of deceleration force, braking from 62 mph to a full stop in just 36m. With 240hp and 350Nm, 0 to 100km/h takes just 4.5 seconds and top speed is 259km/h, but this supercar performance isn’t at the expense of the environment. Due to its light weight and advanced engine and transmission technologies, the emissions of the Alfa Romeo 4C fall well within the strict limits of Euro 6. Its official combined-cycle fuel economy figure is 41.5 MPG and its CO2 emissions are just 157g/km. 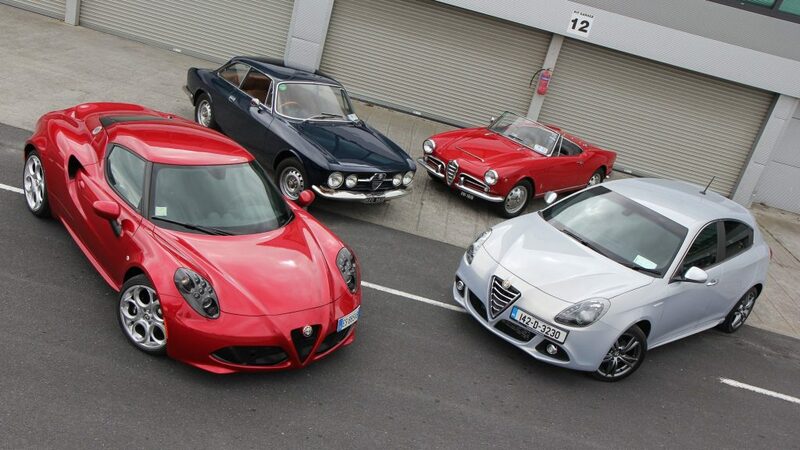 The Alfa Romeo 4C is on sale in Ireland priced from €69,900 and in the UK from £45,000 OTR.